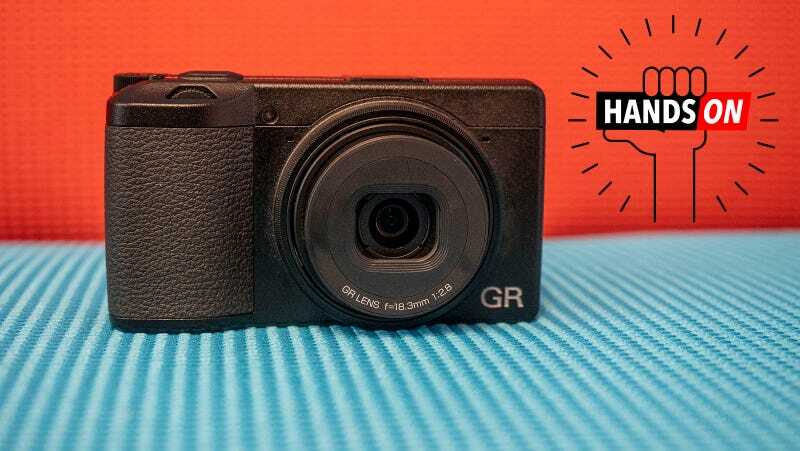 The Ricoh GR II is a cult favorite—A tiny pocketable point-and-shoot camera with a big APS-C crop sensor and a fine 18.3mm f/2.8 fixed lens. While Sony dominates the point-and-shoot field with its versatile RX100 series, the GR II has been a minimalist alternative built for photographers who want to take a step back from all the gadgetry. The new GR III retains much of what made it appealing before, with a few key improvements that should make shooting in tough conditions a little easier. Fans have been clamoring for an update to the GR II (and even the GR I) for some time. It was announced way back in 2015, and even then it wasn’t much of an improvement from the 2013 original. A lot has improved in camera technology since then, and the GR III represents the first major overhaul for the compact shooter. For starters, the new camera features 3-axis sensor-shift stabilization, which is good for up to four stops of compensation, according to Ricoh. Over the last few years, in-camera stabilization has become all-but standard in premium cameras, and it’s nice to see it trickle down to a pocketable compact. Additionally, the GR III features a higher-resolution 24.24-megapixel APS-C sensor, compared to the 16MP GR II. Besides the higher resolution, the GR III also has higher ISO support, with a range from 1oo to 102,400 where the GR II capped out at 25,600. This affords you a little more flexibility to up the sensitivity so you can increase the shutter speed in darker conditions, or situations when you want to capture fast-moving action. There’s also dual autofocus with on-sensor phase matching and contrast detection. The former being new to the GR line up and should allow for faster focusing all around, as well as improved focusing in situations where contrast focusing can struggle (areas without a lot of actual contrast. Also a first for the GR line, the new camera gets a touchscreen. Which means it’s a lot easier to focus. Just tap the point that needs to be clear. You’ll note that there’s now pop-up flash. Ricoh finally axed that practically useless feature. The 18.3mm lens could be a point of contention for newcomers. Personally, I’ve always liked that the GR II had a fixed lens with no zoom. It forces you to consider your shots carefully, and as a pretty gear minded photographer, I appreciate how the GR II or Fujifilm’s XF10 are so simple in their presentation. It’s a break from the gear. The XF10 is a decent comparison camera for the GR III as well. It came out last year, and like the GR III, it’s a compact shooter with a 24MP APS-C sensor, a 28mm equivalent fixed lens, and higher than average ISO. It can go up to 51,200. The big key difference between the two, besides price (the $500 XF10 is cheaper than both the GR II and GR III), is that the XF10 shoots 4K and lacks the in-body camera stabilization. When you’re running around in darker conditions with it, you have to pause and take a breath before you shoot, or risk blurry photos. While I’ve spent considerably less time with the GR III, I never once worried about a shot. Unfortunately, there was a miserable storm in New York City the day I got to spend with the GR III, and I wasn’t allowed to leave the area where we were briefed on the camera, which left me with precious few places to test the damn thing. Shots come off a little cool, but that lemon peel really was quite pale in real life. The GR III can focus as close as 6cm away, which means you can make out every detail in my class ring. This is a JPEG straight out of the camera (Ricoh did not provide RAWs) so those blacks can hopefully be less crushed after post-processing. This is shot at 1/500 and ISO 2,500. You can start to see the grain in the shadows, but the bright and dark areas are surprisingly well balanced. The brick and the safety netting both maintain good detail even when zoomed in. Unfortunately the event was entirely white people which means, until the review, this is your picture for judging how it handles skin tones. Also it was shot at ISO 4,000 and is pretty grain-free where it needs to be. What surprised me besides the nice balance of colors and the borderline unseemly contrast, was how damn sharp the GR III is. The GR III can focus as close as 6cm away, and is still nice and sharp when grabbing a quick shot of the city beyond the building we were in. ISO performance was solid as well. A shot taken in a dark room and facing a much brighter one had a lot of grain, but it wasn’t unattractive, and the darkest shot I pulled off, a selfie at ISO 4,000, is clear and grain free where it needs to be. But how good this camera is will take more testing than an hour at Ricoh’s office in Midtown. Especially because the GR III is not a cheap camera. When it ships in March it will retail for $900. That’s right in line with Sony’s RX100 series cameras, which can do a lot more (including zoom) but feature a smaller sensor. It’s also almost twice as much as the Fujifilm XF100, or the GR II, which is still available.